The day began at City Hall, where activists stepped up to the podium to remind Mayor White and council members of their duty to look out for the best interests of the taxpayers. Considering some of the crooked politicians cared more about reading the paper or staring off into space than listening to the calls for change, the contents will likely end up in the trashcan. But each was provided with copies of “Loose Change 2nd Edition,” “TerrorStorm” and “America: Freedom to Fascism.” A “We Are Chage” flyer was among the literature also included in their Truth packets. The mayor didn’t chicken out and run this time, but the show of disrespect from Michael Berry and some of the other public servants was still quite evident. As should have been expected, Joseph with Houston Truth was moved from his place at the front of the line and wasn’t able to address Council for more than two hours. There was no hesitation once this veteran’s three minutes finally began. The polished speech was set in motion with George W. Bush’s now infamous quote from 2000, “If this were a dictatorship, it’d be a heck of a lot easier. Just so long as I’m the dictator.” Joseph dug in from there stating preparations by the Federal Reserve and the Bush/Cheney usurpation to engineer a financial crisis and enact a full-on police state with Bush assuming de facto dictatorial powers. Stolen elections and “illegal wars of aggression based on lies and greed” were also mentioned as reasons for impeachment. Another longtime activist and 9-11 Truther was scheduled to speak, but because of being moved so far down the list he was on his way to pick up the organization’s featured speaker at the airport when his time came. Three other gentlemen followed suit with 9-11 Truth and a call for impeachment. Armed with a brand new (and first) collection of banners and signs, Houston Truth joined with eight other groups for an all-bridges freeway blogging campaign that spanned across six overpasses on Highway 59. With the exception of a few members and their two banners one street away, at around 5 p.m. the 9-11 group took over the Woodhead bridge -- second in line for inbound traffic and next to last for those heading out. Freeway blogging is nothing new to Houston. In fact some of the local organizations are getting their information out three times a week on average. But 9/11/07 marked the initial attack from above with what so many see as a very radical and even taboo message. Whether or not anyone had held any other type of sign over the freeway before, no one was sure how the public would react on this day. Although there were a couple of signs without 9-11 related messages on the Woodhead bridge, it wouldn’t be hard to imagine that most honks would be in support of the 9-11 information and that the middle fingers would be mostly directed at the Truthers. At first everyone set up facing rather quickly moving inbound traffic. Once the outbound lanes became congested, the majority switched sides. That’s when the fun really began. An adrenaline rush is not the goal of freedom lovers, but the natural response can add to the excitement. After all, spreading Truth lifts the spirit. The parroting sound of horns has been known to send chills through freeway bloggers. On the sixth anniversary of 9-11 it felt like an arctic breeze on a Houston summer day to those holding their heart out for all to see. A wave, a peace sign with a hand, a cheer or honk of the horn make everyone feel good, but not all react the same to the single-finger salute. One good thing is that patriots who are frustrated by an unwelcome response often feel even more driven to help bring change. Another positive side is that those shooting the bird were often amongst the sweet sound of beeps radiating from beneath the hoods of surrounding vehicles. So in a way no matter how a driver replies the outcome is good for the cause. Anyone witnessing the event might come to the conclusion that more expensive cars can lead to ignorance and anger. A detailed graph of the responses would show middle fingers were more often seen behind the windshields or out of the window of BMW’s or other luxury vehicles. Freeway bloggers definitely get as excited as any kid does at the sound of an 18-wheeler’s horn. It isn’t too often someone sees an adult pumping his fist up and down in the air in an attempt to get a truck driver’s attention and the desired blast of air. It also isn’t too often the cry of a siren brings a smile to someone’s face. It was both surprising and inspiring for everyone the few times the lights went flashing for a brief moment below. Because of the bad name so many corrupt police officers give the rest of their force, it is usually expected they’d be the last to show any signs of support or even respect. There was one officer who reportedly offered only a finger. By the end of rush hour it was clear the positive feedback greatly outweighed the negative. The all-bridges blogging didn’t only attract the attention of commuters – it also brought out the media. Don’t get too excited. Of course the only place controlled corporate media was spotted was passing underneath as fast as possible. It would be interesting to see what reports trumped this one on the 10 p.m. news that night. Especially considering the significance of the day and the rare opportunity for a local angle to what has been one of the biggest news events of the century. There isn’t much a news director likes more than the local spin on a national story. KHOU Channel 11, the local CBS affiliate, was notified in advance. And unless the drivers of at least two separate Channel 2 production vans that passed underneath were blind they couldn’t have missed 9-11 staring them in the face. KPRC Channel 2 is an NBC affiliate, which is owned by GE who profits billions each year from war. A photographer for “Houston Indy Media” was snapping photos left and right and a managing editor of “Free Press Houston” made a showing. Courtesy of “911Truth.org,” “Free Press Houston” helped spread the word in this month’s edition with the publication of “The Top 40 Reasons to Doubt the Official Story of September 11th, 2001.” But the most commendable of all the media was Bryan, a true patriot with an awesome video camera and a lot of talent. He must have gone through quite a few tapes as he documented the Truth action throughout the day and into the night. The motto, “Be The Media” has been heard more and more in the Truth Movement as people realize the establishment media not only covers up the Truth, but also lies to the public. Thinking individuals with a story to tell are taking it upon themselves to get the real news out with the help of the Internet. Photographers and editors like Bryan are modern day reporters while those in the mainstream continue to simply repeat the news fed to them over the newswire, which on many occasions has been proven to be completely fabricated. A pan of the camera along fence shows dedicated Americans taking a stand for justice holding their words of wisdom up high. Behind them were other 9-11 Truthers who helped the group’s presence look even larger as they waved peace signs high above the banners. One 9-11 Truther adorned the mask made well known in the movie, “V for Vendetta.” The recognizable image was sure to have triggered deeper thoughts on the subject of a fascist state in the minds of some movie fans. The image that seemed to have ignited emotions more than others was that of a couple of American flags. As the captive audience began to speed up on the outbound lanes the crowd began to move back across the street. This time the group was standing alongside a veteran holding a flagpole that must have reached 20 feet high and strong enough to hold a sizable Old Glory fastened at the top. A second, smaller flag was on the fence displayed with the banners and signs. What was uncommon about the Stars and Stripes flying over the Southwest Freeway is that they were upside down. It was proven, at least in one case, to have been a lack of understanding that lead to some drivers feeling offended. That ignorance even incited one person who didn’t like what he saw to make the drive up onto the bridge to speak his mind. The enraged man quickly quieted when it was explained to him that an upside down U.S. flag is an official signal of distress. It is not meant to be as a sign of disrespect. According to The Flag Code, Title 36, U.S.C. Chapter 10 as amended by P.L. 344, 94th Congress approved July 7, 1976, “the flag should never be displayed with the union down, except as a signal of dire distress in instances of extreme danger to life and property.” As the neoconservatives prepare for another illegal war of aggression while staging an economic collapse, eradicating freedoms and attempting to wrest sovereignty away from The People could there be a better time to lay the union down? Neither an infuriated motorist nor a cop in a black car with dark windows who made multiple passes could intimidate and dissuade any of the group from doing what is right. A couple of people approached the officer once he parked at the end of the bridge for a closer look. He provided his name and said it is standard procedure to survey the activities on the bridges. There are strict laws and it is not uncommon for Houston Police to look over your every move. But an unmarked car seemed a little unusual. As far as surveillance, the icing on the cake was when a military helicopter was sent out for a closer inspection. The chopper was spotted a ways in the distance and easily identified because of the massive gun turrets on the sides. Someone unfamiliar with the scare tactics used and paid for with tax dollars might think it is paranoid to state such a thing, but it seems highly unlikely that the aircraft would have made an appearance without the 9-11 group’s presence. It didn’t take long for the pilot to get within about a block of Woodhead before making a very sharp turn and heading back west. Lifelong Houstonians will tell you that seeing such helicopters is very rare in the Bayou City. Next to roll in through the skies were some dark, ominous clouds moving in from the east. The cool breeze began to blow and the rain quickly followed around 6:30 p.m. Bloggers in the distance could be seen packing up for the day, but the Truthers grabbed a couple of umbrellas and continued to try to educate the masses. There was no slowing this group down. 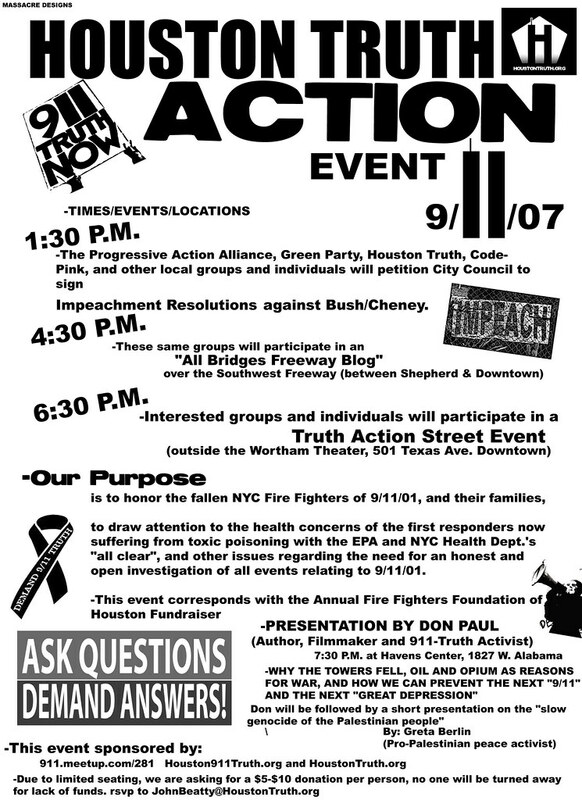 Because of the great success of the event it was decided the previous plans for street action outside of a Houston Fire Department gala would be scrapped. There wasn’t much time left anyway before part three of the massive day of action in H-Town. Only another event could wash the Truth from the bridge.